Background: Asthma is the inflammatory disorder of airways highly prevalent in both, children and adults all over the world. 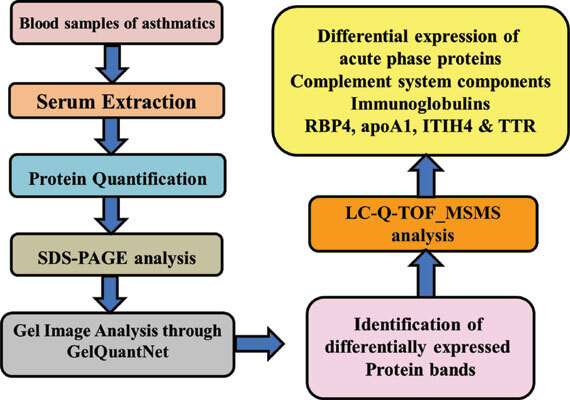 The aim of this study was to investigate the serum proteome for the identification of proteins contributing to the pathogenesis of non-atopic asthma. Methods: Protein expression profiling of sera from non-atopic asthmatic patients (n=73) and controls (n=99) was carried out using 1D SDS PAGE. Differentially expressed protein bands were compared with controls, cut from the gel and identified by LC-Q-TOF_MSMS analysis. Results: Various acute phase proteins (i.e., haptoglobin, transthyretin, serum amyloid A, and serum albumin), retinol binding protein 4 (RBP4), Ig gamma-1-chain C-region, hemoglobin subunit β, complement system components (C8 gamma chain and C4-A), ApoA-1 and Ig κ chain C-region containing protein fractions were predominantly down-regulated in asthmatic patients. Similarly, a higher proportion of male patients exhibited down-regulation of all other (except albumin and C4-A containing) protein fractions as compared to female patients. However, fractions consisting of another acute phase protein, inter-alpha-trypsin heavy chain 4 (ITIH4) and complement system component C3 were up-regulated in the majority of patients. Conclusion: Our study is the first to confirm the role of thyroxine (TTR), retinol (RBP4), cholesterol (apoA-1) transporting proteins, inflammation and its mediators in the pathogenesis of asthma. Further study may help to improve diagnosis and plan better treatment strategies. Asthma, proteomics, serum amyloid A, proteome profiling, acute-phase proteins, serum proteome.